See that? 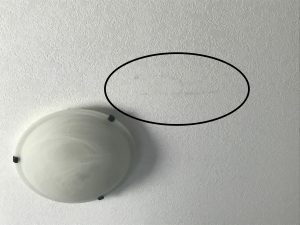 See that line or shadow in the circle on my bedroom ceiling? It might be hard to see in the photo but it’s not hard to see in person. I was laying in bed staring at the ceiling one day after Noah passed and my eyes fixated on this spot. I began to wonder what it was. Where did it come from? How couldn’t I ever have noticed it before? It is on “my side” after all. Right above my spot really. Then it hit me. Like a Mac truck. I *know* what it is. I’ve had similar lines throughout my house in the last 6 years. Sometimes on ceilings. Sometimes on walls. It’s what happens when you press too hard on a syringe when you’re priming or when you are in a rush. It wasn’t there before June 1 I can tell you that. Now my eyes constantly are drawn to that line and I just stare and am constantly reminded what transpired in our house a short 9 weeks ago. Of course they weren’t careful with priming their syringes. I wouldn’t expect them to. But now there it is. I can tell you what medication it probably is that has perma-stained my ceiling and haunts me as I sleep. We were house hunting and closing in on houses and now we have halted it all. How can we move into our forever house now? How can our forever house not include Noah running around and filling it with his unique chaos? But at the same time, how do we stay? So many reminders of June 1 and sadness. But so many reminders of all the amazing memories we’ve filled the house with. How do we leave those behind? I know we take the memories with us but this was his house. His room. He left marks and reminders everywhere. But then there are memories that nightmares are made of haunting the house. If only I could wake from this nightmare.